Skatergirl is cool in every sense, and a champion skateboarder. She’s sharp and smart; a leader. Confident and daring, she needs to be the best at everything. She’s also a fantastic rapper. Jim Belicious’ profile is not so cool but is definitely interesting. He loves bird-watching and collecting buttons. He owns no personal mode of transport, but when he bumps into Skatergirl, they strike up a friendship. 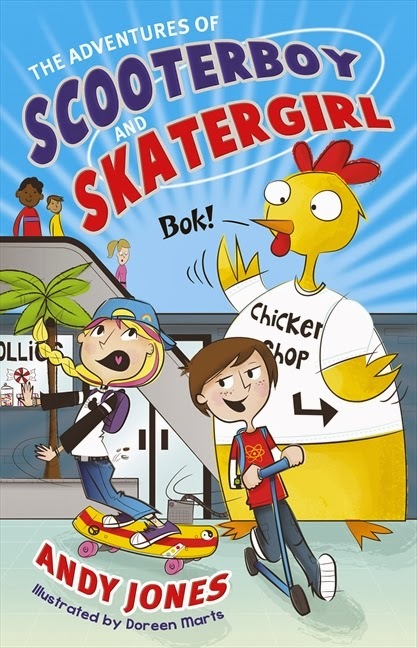 Skatergirl temporarily lends him her fold-away scooter, and gives him a new name. Jim transforms into Scooterboy. This chapter book is compiled of eight stories and two complete profiles on the main characters. The stories are cheeky, gross, and full of fun and adventure. They are exactly what kids will love and are created with the reluctant reader in mind, regardless of gender. Each story ends with a positive message/lesson. I loved the fact that the language used doesn’t underestimate children. It dares to be honest and realistic in reflecting childhood’s idiosyncrasies. The verbal exchange between the two characters identifies with kids everywhere trying to outdo each other in grossness. This is the fourth book by Andy Jones and I can see him becoming a favourite with younger readers. I visualise my nine year old reluctant reader turning the pages and laughing out loud at all the things he can relate to.